As I’ve been digging deeper into the data I’ve gathered on 210 million public Facebook profiles, I’ve been fascinated by some of the patterns that have emerged. 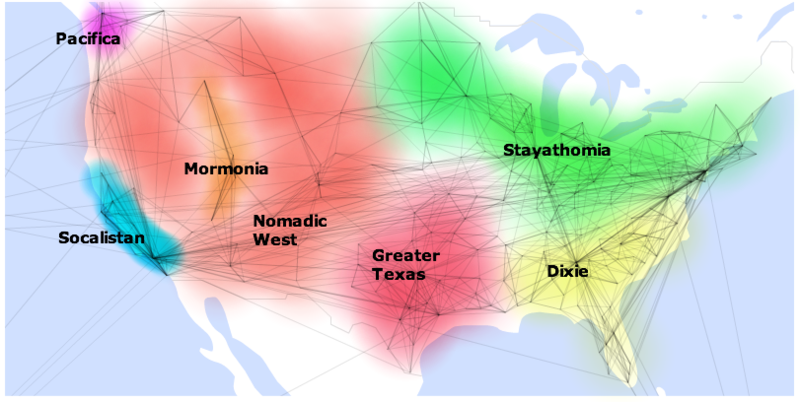 My latest visualization shows the information by location, with connections drawn between places that share friends. For example, a lot of people in LA have friends in San Francisco, so there’s a line between them. Some of these clusters are intuitive, like the old south, but there’s some surprises too, like Missouri, Louisiana and Arkansas having closer ties to Texas than Georgia. To make sense of the patterns I’m seeing, I’ve marked and labeled the clusters, and added some notes about the properties they have in common. Continue reading at Pete Search . . .